Princeton Tec, renown for its dependable and innovative lighting products, will release its new rapid charge LED lighting systems for 2007 called the Switchback Bike Light Series. The new series is specifically designed for high performance- targeted to the mountain biking and 24 hour racing consumer. "Endurance mountain racers need a lighting system which will provide them with not only a strong, rechargeable and reliable light source, but both primary and secondary lighting products," said Dave Cozzone, Director of Domestic Sales & Marketing for Princeton Tec. "The Switchback LED Series has three models which will offer riders three different levels of lighting output to fulfill all their needs." 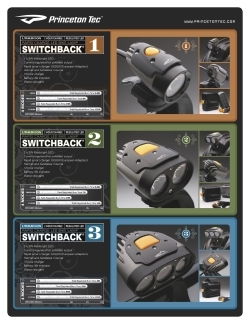 The Switchback Bike Light Series consists of three models; the Switchback 1.0, the perfect light for long distance road riding or as a back-up light for trail riding and mountain bike racing; the Switchback 2.0, designed as a primary lighting system for trail riders as well as a secondary light for mountain racing and the Switchback 3.0, with six hours of constant light output this is the perfect choice as a primary light source for mountain bike racing! Each model utilizes a powerful, bright 3 watt Maxbright L.E.D. bulb combined with a Collimated lens system for optimum light output; is waterproof to withstand harsh weather; has a lightweight Lithium Ion battery pack; LED battery power indicator; multiple output modes- High, Medium, Low and Strobe; and comes with a 12 volt car charger and both helmet and handle bar mounts. The real strength of this series lies in its rapid charge system, which takes only two hours to totally recharge the battery pack; the voltage regulated design for constant light output; and its proprietary circuit design for maximizing light output and efficiency. "Princeton Tec's new Switchback series will offer cyclists lighting products with a light output equivalent to an HID system but with the New Maxbright LED technology, the bulbs will be virtually indestructible," said Cozzone.